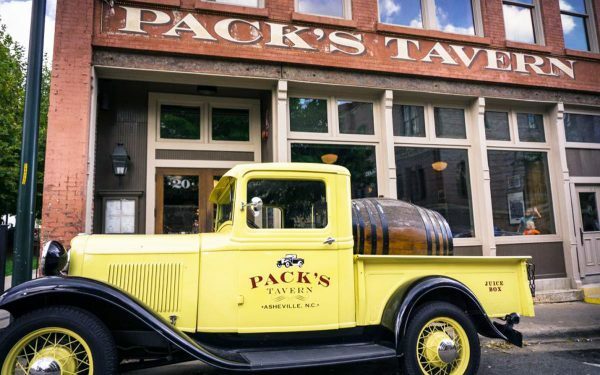 Pack’s Tavern and the “Yellow Truck”! In the heart of downtown Asheville’s Pack Square Park, the historic Hayes & Hopson building has served the local community for many years. The building that houses the Tavern’s “South Bar” was built in 1907 by a local lumber supply company and remains one of the oldest buildings in Asheville. As the demand for lumber grew, the supply company built an additional building to the north. Erected in 1912, this same building is the location for the main restaurant and bar area as well as the second-floor event center, The Century Room. Prior to its use for an auto parts store and a famous BBQ restaurant, the Hayes & Hopson building was rumored to be an illegal liquor distribution hub that served most of Western North Carolina during the 1920’s. When Prohibition began on January 16, 1920, the story goes that shortly after a lucrative distribution center for moonshine was established in this very basement. Using the lumber supply front, its “loading dock” on the side of the building and a little underground tunnel across Eagle street, business boomed. For the next 12 years, large quantities of white lightening were coming and going. In 1932, the Democratic Party promised, if elected, to repeal Prohibition. Nine days after Franklin Roosevelt took office in January 1933, the sale of beer was legalized. Prohibition was fully repealed in December of that year with the ratification of the 21st amendment. Hence, the theme of Pack’s Tavern is 1932 – as a tribute to the beginning of the end of Prohibition. Taking great care in the design and build of our beloved Tavern, the owners won a prestigious “Griffin Award” for period restoration to the post-Prohibition Era. Our beloved 1932 Model A Ford Truck, affectionately called our “Juice Box” or more commonly “Pack’s Yellow Truck”, has become one of the most photographed icons in downtown Asheville.